As bathroom remodeling company in the Tri-State Area, Divine Design Stone & Cabinetry can transform your bathroom into an entirely different space. 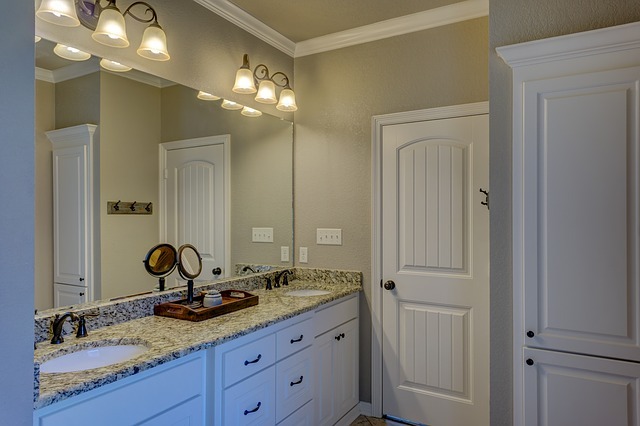 One of the most popular materials for a bathroom is marble, timeless, and elegant it adds a classic touch to any space. This natural stone is being used in surrounds, baseboards and even as furniture in a room. In recent bathroom renovations, many folks are increasingly replacing the traditional bathtub with a shower base/tray, while the latter is fitted with a bathroom glass door. The trend is using transparent glass doors versus that of translucent glass, which was most common a few years ago. The replacement of the bathtub tries to create a more energy efficient space while placing more care on water consumption. On the other hand, in the larger bathrooms, there are those who do not want to give up the pleasure of taking a bath on special occasions. In these cases, it is common to have both a shower area and a bathtub area. At Divine Design Stone & Cabinetry, we are experts in bathroom remodeling and masonry work. We also carry an extensive selection of semi-custom and custom cabinets for your kitchen or bath. Granite, Marble, Quartz or Onyx, whatever your preference, you can rely on our years of experience and our dedication to excellence. As a company specializing in bathroom remodeling in The Tri-State area, we can take care of adapting your bath to meet your needs. Not all baths or everyone’s needs are the same, do you need a child-friendly bathroom? Perhaps a half-bath in the basement of your home? Maybe you need a bathroom more suited to an elderly family member. We advise you every step of the way and adapt our designs to your needs. For example, in the case of a bathroom with a senior in mind, in addition to perhaps replacing the tub with a shower, you may desire to have a bench area. In the case of the shower door, it is best to use a sliding glass door so that, if the person suffers a fall inside the bathroom, it will not block the passage. Also, it is best to install non-slip material flooring. Of course, space must be wide and allow, if necessary, wheelchair access. Perhaps non-slip support bars are needed, sometimes there is a need to reinforce the wall beforehand so that they are correctly fastened. Another example might be a child-friendly bathroom with Anti-Scald Faucets, although it’s a good idea no matter the purpose of the bathroom… As professionals of bathroom remodeling in the Tri-State area, we are here to help guide you through all the choices necessary to give you the bathroom you want at an affordable price. Use the contact form above, or give us a quick call to discuss your project.